A few hours before the queen of England could press the red button to begin the London marathon; the deputy president of Kenya was the first one to aim his gun towards the sky and fired it to set off the inaugural Eldoret City marathon here in Uasin Gishu at exactly 8:00 in the morning. The women's race had been started 30 minutes earlier. Both the organizers of the Eldoret city marathon were eager to finish the race in time to watch the start of the London Marathon. 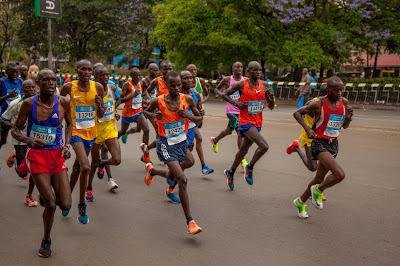 Touted as the richest marathon in Kenya and being held at the heart of the athletics community in Kenya, the Eldoret City marathon attracted one of the most competitive fields ever assembled in any marathon race anywhere. Not only was it because of the prize money, but it was as well an opportunity for others to take advantage of the cleared traffic and availability of water on the course to do their long run. Add that to the fact that the athletes had no issues applying for visas and purchasing air tickets to get here and you will understand why the fields were big and loaded. 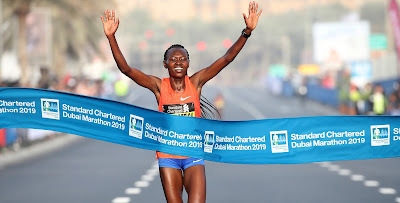 Elkana Yego, popularly known as "Kapkarwa" and Sharon Cherop, the 2012 Boston marathon champion emerged winners in the inaugural race on Sunday. The men's race was particularly more competitive with three athletes battling for the prize up to the last few hundred meters of the race before Yego used his 1500m track experience to kick to the finish line in 2:12.44 where he almost collapsed to the ground had it not been for the medical staff who immediately caught him as he was about to fall. Philip Kangogo, past winner of the Barcelona and Kass international marathon came in second in 2:12.49 while Brian Kipsang followed closely in 2:12.50 to complete the podium. In the women's race, a huge pack was together till after the 10km mark when there was a sudden move that immediately stretched out the field. Almost all the leading ten to fifteen runners each had a personal pace setter and by the time we crossed each other as they came in the opposite direction, they were running in pairs at around the 30km point. Cherop, with her pace setter, had already opened a big gap against her challengers and remained a clear contender till she crossed the finish line in 2:29.57. Lydia Cheromei followed to take 2nd place in 2:33.25 while Jane Seurei took 3rd in 2:33.46. After finishing the marathon, we passed by the huge screen in Eldoret town that had been broadcasting the Eldoret marathon. There was so much in common happening between the London and the Eldoret city marathon, one being that Yego and Shura Kitata were in the same leading pack at the Ottawa marathon in 2016 where Kitata had finished second, while Yego had finished 6th. I had shared the same hotel room with Yego as one of the elite athletes in Ottawa, but had not ended up in the leading pack myself for a considerable time. And, as Yego won the Eldoret City marathon in Uasin Gishu, Kitata was finishing second behind Eliud Kipchoge in London marathon!